With our last few games of the summer season fast approaching I’ve seen that the Abingdon Winter Aunt Sally (WASL) sign on sheets are out and about. Abingdon Winter Aunt Sally is extremely successful. Run firstly by Brian Clapton and now by Tosh Wooloff it has 10 teams. Each team has 5 active players plus a few spare. The teams are split into A and B section with 5 teams in each. All the matches are indoors at the Abingdon United Football Club. During the winter I play for a different team than I do in the summer and so do most of the other players. The teams are much more varied and the scores are much closer. Playing begins at 19:45 SHARP!! With all 5 games lasting around 30 mins each. Yes it’s pain being last on but that’s the price you pay for some good Aunt Sally. I’d like to say that the winter league isn’t taken as seriously as the summer, but I’d be lying. It starts off that way. A bit of fun and a laugh, but as the season progresses that all changes and it’s just as competitive. Is it better than summer? Well, it’s different. With only 5 players a bad leg is bad leg. Often you will see a good team only hitting 10 or 13. Without an 8 man team to raise that score everyone needs to be playing well. This keeps the league interesting right up the last game. For the last couple of years this has gone to the last game of the last night, gripping stuff if you like your Sally. If you haven’t played perhaps you should consider coming down for our first practice session (I’m not sure when this is, keep an eye on the web site ED- there’s no friendly this year as the summer Wed Competitions had extended the season) A friendly between the teams. There are always spaces on teams and it gives you a chance to meet and play with different people. There isn’t any practice though you can turn up before the 19:45 start time and have as many throws as you can get in. Playing in the winter gives you the opportunity to modify your throw and get some practice in ready for summer. I can’t say this enough, the people there are super friendly and will help with advice on any part of your game. Also there are a fair number of the summer committee playing there. Graham Barguss, Graham Brown, Terry Downes, James Barguss, John Simmonds and Paul Stone. This is a good time to approach (obviously not during the game) and discuss ideas or issues you may be having and give some advice as the best way to solve them. The winter league doesn’t have a committee as such. Tosh runs it and what he says goes, although as teams we all vote on any decisions. My next few blog posts I hope will be interviews with some of the better players within the league. Unless of course I don’t get any replies back! Remember also we have finals night approaching (Wed 28th Sep) and ALL of the trophies need returning so that they can be engraved ready for presentation night (Fri 28th Oct). Apologies on the lateness of this blog I’ve been a little busy of late. This week’s blog is a little different. I was recently emailed by someone asking for my opinion and I thought I would make my thoughts this week’s blog. So thanks to Dave. If anyone else needs an urgent query answering, if I can’t answer I do have access to someone who is even more knowledgeable than I. Though to be fair, that’s not hard. 1 – Advice on playing in the rain and keeping your average. Playing in the rain is a great leveller. For players that throw the stick rather than let it slide through their hands it shouldn’t be a problem. Issues arise when the stick gets wet and sticks to your hand. Keep a beer towel in your bag at all times and as soon you’ve thrown give each one a proper dry even if they look OK. You will find that they should have dried enough to throw again. Of course once dried you should store them in the car or under the table not leave them in the rain. If you are at home you should always have a dry bit of carpet to put on the floor for the match. This is so important. How many times do people complain that they don’t like playing in the rain but then neglect to provide a dry area in the shed. Surely, that’s common sense. Some people get their sticks drenched and find that easier because then it’s uniformly wet through out the stick. Me? I use the beer towel works every time. Keeping your average up is better answered in 2. 2 – Does practice make perfect, I threw 4 4 4 in practice and X 1 2 in the game. Is it all in the head? Practice does indeed make perfect but not really on game night. If at all possible use another time, I like to throw on a Sunday afternoon if I can. Too much practice right before a match tires your arm a small amount and you either drop short or over compensate and go over or are wild. 3 practice throws on a new pitch is the maximum. 2 on a pitch you’ve already thrown on. Once to loosen the arm and another to get your eye in. NEVER EVER throw a 6 in practice I guarantee you a blob and a low score. If you get your first 3 throw the next 2 away and try for the 6th. You’re just wasting dolls here. The reason you get more when practicing is because you are more relaxed, even if you think you’re doing everything the same, little things like not extending your arm as much or, letting go of the stick a fraction sooner than you would normally. Get someone you trust to stand behind you during practice and get them to watch, or better still get your digital camera and film your throw on Sunday afternoon that’s when you will be most relaxed, sounds silly but it will give you a good feedback. I’ll use golf as an example. Nick Faldo and Seve Ballesteros. Both great players but Nick Faldo before playing would hit 500 balls to get his eye in and get his muscle memory in tune. Every time he played he did this. Seve Ballesteros never did anything like it, he was a natural and didn’t need to. There is a good proportion of it in your head as well. Go out there and really concentrate on getting that first doll. Once you get the first your confidence goes up, it’s all about that first doll, I can’t stress that enough! With respect to keeping up a decent average I would say the more time you think about it the worst your average will become. You end up putting too much pressure on yourself and as a result end up with a poor score. In fact the best way to score well is to be relaxed and concentrate on getting that first doll, then the second and so on. I never think with three in the bag I could get a 4 here. Rather I think, “I just want one more, just one more” Think of what you need now not what you need for a good average. 3 – Should I sand my sticks? Sanding sticks is personal preference I never do unless I have splinters. From question 1 if you slide the stick in your hand then it needs to be smooth, if you throw the stick without sliding it at all then don’t bother. However, some players use the sand as a psychological tool to get them in the zone before they throw. It’s less about the actual sand and more about the focus it gives the player, a ritual if you like. Singles competitions are the absolute pinnacle of what makes a good player a good player. Every player is nervous in the singles comp it’s just how they show it. To get around it you need to put yourself in that position loads so that you feel at home there. And always try to be as relaxed as you can, even if you really aren’t. It’s no surprise that you see the same old faces in the singles competition. They’ve, literally in some cases, been doing it for years. It becomes second nature and they are able to play through the nerves, even use it to their advantage. I’ve played a couple of games recently where the the extra dolls that teams get under the handicap system have allowed them to win a few points from us. That’s exactly what system is designed for. To allow teams that wouldn’t normally be competitive a chance to win games. With the Premier and A sections being combined there is a massive difference between the averages of the top of the Premier and the bottom of the A. Taking a quick look the Waggon and Horses at Southmoor are averaging 15.85 a leg. Compare that to the Spread who are averaging 25.36 a leg. There is a need for some way of levelling up the scores so that there is a competitive edge to the league. In an ideal world we would have evenly matched teams playing each other. But that’s just not possible with falling numbers and ranges in ability. The handicaps are created at the beginning of the season. Once all the registration forms have been returned the averages of the all the players are calculated. The best 8 are then added up to give an idea of what that team is capable of. This is where things can go a bit wrong. If you sign a player that has a relatively high average, more so than the section you are in, it will put you higher up or possibly the next section or give you less of a handicap than you otherwise might be entitled. Once the averages are in the committee get together and discuss who’s moving up, going down or staying put. Then they take a look at how big a difference it is between the top and the bottom teams. The averages are then calculated to raise the scores and add a competitive edge. That’s how it done. Not rocket science but it does take some time to do. I know from speaking to some of the Friday night Oxford league players that the handicap system there is even more brutal 6 dolls or more can be added to a teams score. The system in place at the moment is pretty controversial and sometimes it doesn’t seem fair, but when is life ever. The thing is what could it be replaced by? I know that the committee are open to suggestions. Do you think it goes to far? or do you think it doesn’t go far enough. Leave some comments at the bottom or come along to the AGM in January to voice an opinion. Finally should you carry the handicap over into the beer leg. It’s really up to the teams. There aren’t any hard and fast rules. If the team your playing has just won 6-0 without the handicap then clearly they don’t need it. If they haven’t then maybe they should be allowed to keep it. If you have a team with 3 dolls and a team with 2 dolls then you take one from the other and the 3 doll is reduced to one doll with the other team getting no extras. Captaincy and the coin toss. We’ve all got one, they head the team up, pick the team and call or toss the coin. Most Aunt Sally Captains once they attain the rank stay there for years. I don’t know why. My theory is that most people think it doesn’t matter who it is, only that you have one. That’s a fair enough point. The only real pressure is who to pick and who to drop. If the team is running the ‘lowest score of last week is out’ then even that is taken care of. Teams like setting, teams like chasing. Some love to chase big scores, and the pressure that comes with it. Some can’t do pressure at all and fold. Your Captain needs to know what type of team you are and what the opposing team prefer. A few years ago my Captain and I made a note of who we were playing, who won the toss, the choice that was made and then who won the leg. The results were surprising, not for us, we suspected this was the case but needed to prove it. Some teams (read Captains here) are unable to read the situation. They go first every time they win the toss, every time no matter what. So prevalent is this trait or foible that we gave it a name. The Oxford call. During years of playing in various Oxford league and competition matches it’s where we first noticed it. Not that they do it anymore or less than Abingdon. Now if you’re the Cricketers (Ox) or the Spread ‘A (Ab) this doesn’t apply to you. These rules work 90% of the time and are tried and tested. They work if you have a team of eight or you are on your own in a singles competition. The rules always have exceptions. But you can play some real mind games with some Captains and totally psych them out. Always be unpredictable and always be prepared to take a risk. I know of at least one Captain who really takes this as far as you can take it and will actively psych out the other Captain during the toss. He’s good at it too, I’m pretty sure no one has cottoned on yet. Remember the toss is all about being in control. It gives you the opportunity to make a choice that gives your team the best chance of winning the leg/match. I was speaking with a good friend of mine on Wednesday night. He mentioned that at the weekend he attended the 1st World Aunt Sally Championship at the Charlbury Beer Festival. He passed on some thoughts which I feel I should share. The claim of the organisers that it is the first ‘World’ championship is a bit misleading as some years ago the Abingdon round table organised a Singles and Fours World Championship in the Abbey Meadow. The singles competition was won by Dave Dix but I’m afraid my memory fails me as I cannot remember the fours team winners. However, this is unimportant and me being pedantic. The Charlbury competition had 32 players playing a down to a final. Initially the weather looked as though it would be an issue but, after the draw, the sun came out. I’m told that the two Abingdon players that did attend are not familiar with that area of Aunt Sally world so it was nice to have a few throws against some different opposition. I won’t bore you with a blow by blow account of the competition I wasn’t there vbut both players that did attend said what a great day it was. In particular to note the calling was to a very high standard. It’s always difficult particularly when playing in unfamiliar territory and you always have at the back of your mind that calling might not be as good as you are used to. In fact I am told it was as good if not better. I’m afraid I do not have the names of the two gentlemen in question that did the calling and sticking up (all day) one of whom made it to the final. I hope they read this and are able to add their names to the comments section they deserve a little recognition for a well organised event. Something new was brought to my attention which I wasn’t aware of and I apologise if the exact details are wrong here but the gist is. In the Wychwood league owing to the small number of teams in the area they have reduced the team number from 8 to 6 and instead of 3 play the best of 5 legs. Having played for 20 years I have seen our numbers dwindle steadily every year. The smoking ban, the cost of beer, the recession. All I suppose have taken their toll. I’m aware that in my own team we have nine regular players and that’s about it. We have players we can call in if needs be but its certainly getting worse. How long before we can’t get a team? We’ll have two choices join with another team or try to find new players. (If we could have found new players we would have done so) .Would reducing the team numbers be the answer to our shrinking league? I would be really interested to find out your opinion on this. It’s successfully done in the winter with teams of 5. Something else that was mentioned was that there were a lot of very decent Aunt Sally Players at the World Championship but who, for what ever reason, didn’t put their names down for the competition. I have to ask myself why. Is pride a factor here? Not wanting to be beaten by what are perceived to be lesser players? Or the credibility of the competition? Who cares it’s their loss. It sounds like it was a great day that was a lot of fun for all involved. There was a very sizeable crowd for the final. If that gets a few more people interested in the game we all win. As I covered throwing I guess it’s only fair I shine this week’s spotlight on the black art that is Calling. I’ve done loads of it and I like to think I’m better than average at it. I’m lucky in that the people I play with are also very good and in doing so have showed me how I can be better. I’m always open to what other people say as long as it isn’t aggressive. 1. Stand close to the doll. This is key, if you’re standing 10ft from it how can you see a close shave or if the stick clips the offside of the doll. I stand one large pace back. I’ve been hit by a stick maybe twice in 20 years. There are always times when this isn’t the case. For instance if the doll is hit squarely on the top it will fall forward also if the stick hits the very bottom of the doll and iron at the same time. 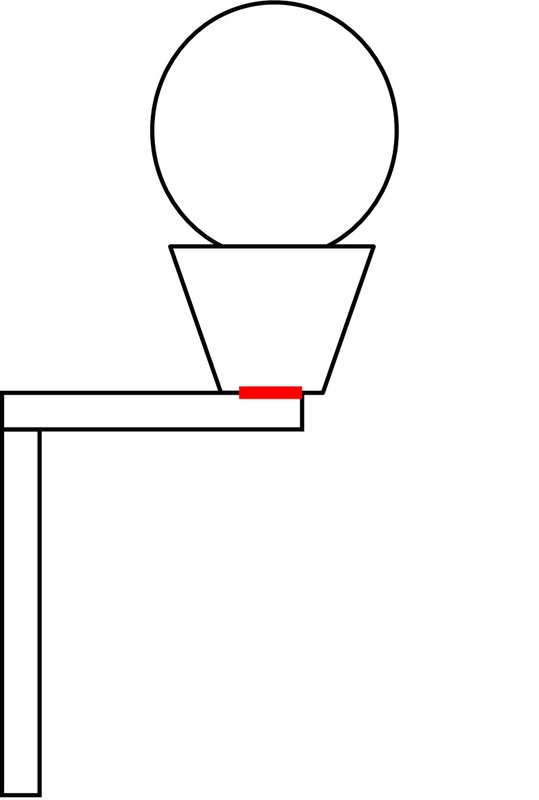 2(b) Doll placing – The doll should overhang the swivel with a gap all around. The swivel should NOT be bigger than the bottom of the doll. If the bottom of the doll is smaller than the swivel you need to place the doll at the front with at least 5mm or 1/8 of an inchoverhang. This is crucial as it means you can hit the doll on the very bottom and not get a doll because you hit the swivel and not the doll. See below diagram. The red line is the top of the swivel with the doll overhanging it. As a caller it is your responsibility to ensure the doll is placed on correctly. 3. Never step in front of the doll to replace it – Always put it on from the side. A lot of players especially the good ones will not take their eye from the swivel at all. If you break the line of sight it can be off putting. Though not as much as………. 4. Never look or stare at the thrower. It’s extremely off putting. I learnt this hard way when I was 14 years old. The barrage of abuse I got was pretty harsh, but I never did it again. A fair amount of players, once the first doll has come off throw with a rhythm – this can end badly if you decide to go back to centre the doll. Leave it. I know players who begin to throw as soon as they see the doll touch the swivel. It sounds controversial but why not ask the other person what they think. If the stick has clipped the doll on the other side then they are best placed to say yes or no. Not everyone likes to call but they should be able to tell a doll. A personal pet hate of mine is a Caller who won’t move and expects the other person to do all the work. I mean it’s not difficult to do even if they just throw the doll to the other person to place it on the swivel. Another is people who get aggressive when a call has gone against them that they thought was a doll. I’ve lost matches for the same reason and have never given it another thought. We play for fun, if it’s that big a deal for you maybe you should try something that doesn’t involve humans because we are all fallible. We all make mistakes so you shouldn’t be afraid of getting it wrong. I do occasionally. You find people who complain loudest are the people who refuse to call or are worst at it. And finally as is the case with everything it’s practice that makes you better. So when the Captain is asking for a Caller and Sticker up why not volunteer instead of waiting to be nominated or worse still, not going at all. I’ve seen some pretty radical throwing styles in my time. John Simmons former Cumnor Cricket and now the Spread Eagle. Standing to the extreme left and the stick staying completely horizontal until the last 10 inches where it moves up and cracks the doll off. Hugely successful and I can’t think of a better player in the last few years his average is one to be admired. However try and replicate it and anyone unfortunate enough to be sticking up is going to be in serious danger. For us mere mortals, we are going to use a more standard throw. But I’m a beginner what throw should I use? First of all you need to be comfortable and you need to have good line and length before anything else. Grouping is also important. Watch the really good players and you will see that when they miss, it’s by a fraction. There are no wild sticks they are all in the same place. When you first begin playing if you are getting a good score week in week out then obviously you don’t need to change anything. If you’ve started and don’t seem to be getting any better then you need to change or adapt to become better. Step forward with the same leg as your throwing arm (right or left). This type of step generates the most power and is the most favoured amongst players. But it also pulls the stick slightly to the side you lead with your leg. This means you need to compensate either by standing slightly off centre or changing where you let go of the stick. The throw you get here has more of an arc or curve to it. Step forward with the opposite leg to one you throw with. This doesn’t develop as much power so you need to throw it slightly harder. What you get is a much straighter trajectory and you can stand more squarely on if you so wish. Really you should approach the Oche and without thinking throw a stick. This above all else will decide which leg to step forward with. Changing it will only confuse matters. The Cross Stick, that is with the stick horizontal when it reaches the doll I suppose is the holy grail for most. It provides the largest area with which to knock the doll off but is hands down the most difficult to produce consistently. It’s beautiful watching a good cross stick thrower, it looks effortless and they get so many dolls. However if you can’t do it naturally and by that I mean if you throw the stick and it turns without you forcing it fine. It is not normally something you can teach. Trust me, I’ve tried for 20 years. It doesn’t work for me I’ve stopped trying. I suppose if you tried hard enough you probably could but who’s got the time to invest. A combination of the 2 is preferably the best option. A slightly diagonal stick covers most of the bases and is more forgiving than a straight stick. My conclusion here is this. If you have been throwing for say more than 2 years and you’re not averaging 6 or 7 dolls then you need to change your throw. Not radically but it needs changing. Common issues I see all the time. 1. Holding the stick right at the bottom so that when you let go its spins too many times. A stick should spin in the air a maximum of 2.5 times no more. Holding a stick at the bottom reduces control. Move your hand to the middle or just above / just below the middle. If you find now that you can’t get the stick all the way, get lighter sticks. 2. Bent arm while throwing, your arm should be straight. The more movement you have in your throw, the more parts there are to it. The more can go wrong. There are exceptions to every rule. Jason Bowler Spread Eagle ‘A’ holds the stick right at the end. It spins loads but is very accurate. It’s a good throw for him, it won’t be for you. Look at those players who consistently get good scores every week their throws will follow the basic rules above. And the key thing here is that they will adjust they way they are throwing to suit where they are. If it’s not working on that first practice they’ll move a bit adjust the power etc its imperceptible but they do. It’s common practice if my throw’s not working for me to ask one of the other players on my team to stand behind me and tell me what I’m doing wrong. In golf they spend literally hours perfecting the swing. Video is used, diagrams, the works. Now I’m not saying that you set up a video camera but everything about being a good player is in the throw just as a good golfer is in the swing. Get our throw right for you and the dolls will come. On Wednesday evening I asked which competition was on Thursday. To be told ‘8’s Knockout semi final’. ‘Semi final?’ I replied ‘did I miss a Thursday?’. ‘No, only 6 teams entered’. That seems like a pretty poor state of affairs that only 6 teams have bothered to enter. I wonder why? I suspect there are more reasons but I’m not writing a novel so I’ll stick with them. 1. For the first I would have to say ‘how can you possibly know that’. Does the fact that Oxford United have no chance of winning the FA cup stop them entering or the force India team of taking the Formula 1 title. There is a competition in Oxford called the TV cup. It’s a singles competition with a cash prize for the winner. Not big I think £250. It’s not open to Abingdon league players you need to be signed on for an Oxford side (see footnote below). When I was 18 I played for an Oxford team on a Friday allowing me to circumnavigate that particular piece of law. At 18 I think my average on a good night was 2 (6 per game) but I thought it would be a laugh plus the level of competition would be high so there would be some good games to watch. The games alternated between the Gladiators Club on the Iffley road and Blackbird Leys Community Centre over a month or so. I’m not going to bore you with a blow by blow breakdown of every match I played – I can’t even remember how many people entered. I do know that I played and won 4 games to make it into the top 8. I was stopped by Monty Greenaway pretty convincingly. My point is I’m not the best player at all. Back then I was worse. Sure there was luck involved but not the whole way and I beat some very good players to get there. I shouldn’t have got past the prelims. It gave me tremendous confidence though because in my head I knew what was possible. I see the same people year on year at the competitions and I just wish there were more is all. 2. I play both winter and summer Aunt Sally with something like 3 weeks break at either end and have done for many years. So I can certainly sympathise with too much in your life but taking it seriously adds to the fun. Who doesn’t like winning? And 3 I love netball too, stick with it. p.s I think the reason Abingdon players aren’t allowed to play is because a certain Martin Sheridan had the audacity to beat all the Oxford players one year. Which caused outrage and a banning of all non Oxford players? I could be wrong. If I am email me. When you think about it the two most important places in the team are your first man and the tail ender – The Anchorman. Perhaps I should use person. I’m not sure seeing as I’m a man I’ll stick with that. It’s a team sport but it’s really these two players that can make or break a team. A good lead man or woman can really set the tone particularly if you’re chasing a big score. A 4 or 5 or occasionally 6 suddenly makes that big set look possible. I’m not going to dwell on the lead man, at least not now. This post will mainly cover the Anchorman. 1. Place your best players at the top so that when it comes to your last couple of players the score has already been attained. This means you don’t need a strong anchor man and if your top tier players are good no pressure meaning the anchor will get a few to. 2. Spread your good players amongst the team with the better player’s bookending the team. This allows more flexibility if the teams not all on song. If you look at the top of the leagues. Premier, A and B sections the top teams will definitely follow school 2 with the very best having an Anchorman who can really turn it on under pressure. I think that’s the introduction over. My focus in this post is going to be what happens when it all goes wrong. I speak from experience here! It really doesn’t matter what the score that’s been set is. If the top half of your team has only got a handful of dolls all of a sudden everyone is looking at you the Anchor to pull them out of the hole they’ve blindly dragged you into. If you’re looking at any more than 4 Dolls everyone is going to be happy with the draw and to be honest it does take a little of the pressure off hence I reckon 60% of the time I do it. Everyone hopes you do but won’t be too annoyed if you don’t, lets face it they put you here it’s half their fault as well. The problem is when it’s a 2 or a 3 you can easily get this. You know what your average is. You know that on any given day you could get that with your eyes closed (figuratively speaking of course, that would be dangerous). Because you know it’s possible somehow you put just that little bit of extra pressure on yourself and boom you blow it. That’s a lonely walk back with your sticks I can tell you. There I think it’s the crux of it. The pressure the anchor puts on themselves is far greater than that of the teams. In conclusion then when it’s easy it’s hard, and when it’s hard it’s easy. I’ve been playing for 20 odd years 3 as an anchor man. I’ve seen some truly world class Anchors do the business time and time again.